The idea of a boy or girl and a dog is iconic, the theme of hundreds of books, movies and television shows. Experts are now finding that for many kids, it’s more than a plot device for fictional childhood adventures. 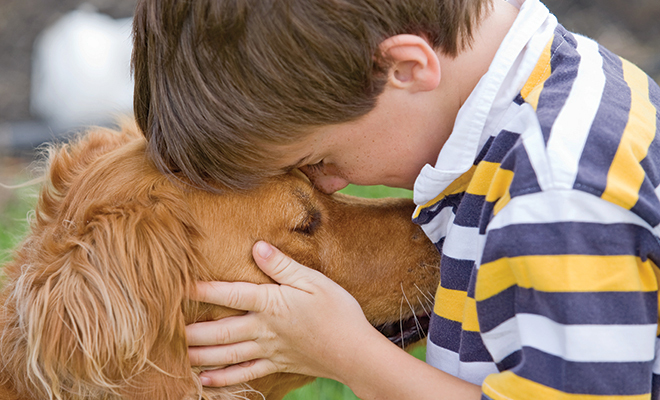 There are a number of health benefits for kids in having a dog, both physical and psychological. Some of the latest research has linked contact with dogs, including dog kisses, to disease prevention. Studies presented at the American College of Allergy, Asthma and Immunology Annual Scientific Meeting indicated that children raised in a home with a dog have fewer colds and ear infections and need fewer antibiotics than children raised in dog-free homes. One study from Finland showed that children who live with a dog were 31 percent more likely to be healthier. Households with cats had only a six percent improvement. For young children, the numbers were even greater. Early exposure, said researcher Dr. Eija Bergroth, who published his study in the journal Pediatrics, showed that they were 44 percent less likely to develop problems such as ear infections. His theory is that exposure to dogs primes a baby’s immune system to fight off bacteria and viruses. 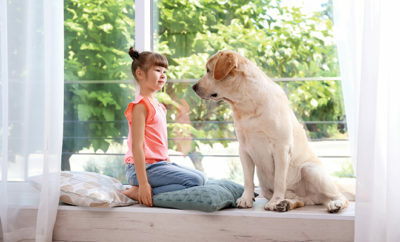 There is strong evidence that having a dog in the home can lower a child’s risk of developing childhood eczema and, later in life, asthma or allergies. A combined study by the University of Arizona and University of Colorado showed a stronger relationship between the “good” gut bacteria found in yogurt in people who share their homes with a dog than those who do not. For kids, this good gut bacteria seems to have a direct result in reducing the rate of immune-related illnesses, including asthma and allergies and, some studies suggest, inflammatory gastrointestinal diseases such as Crohn’s disease. The effect is especially strong with children a year old or younger. A study published in the journal Social Development looked at nearly 100 families and their dogs. The children, ages 7 to 12, were asked to perform public speaking and mental arithmetic and then were tested for levels of stress hormones. Kids who had their dogs with them were found to be less stressed, with the rate of stress even in lower in kids who got to pet or cuddle their dogs. Sources: acaai.org, blogs.scientificamerican.com, huffingtonpost.com, mnn.com and nytimes.com. ← Previous Story Caregivers Needed!